People often cut sugar out of their diet when trying to lose weight, control diabetes or simply improve the quality of their food and beverage choices. Regardless of the reason, giving up sugar can be challenging. Also, the omission of sugar or other related diet changes may even be linked to headaches. 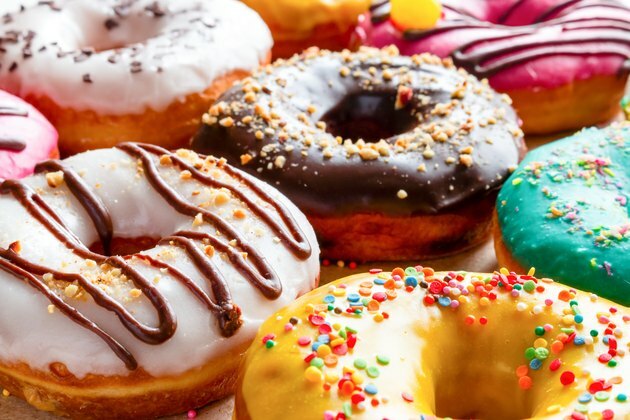 While it's plausible that abstinence from sugar can lead to withdrawal symptoms, including headaches, there are other potential and perhaps more likely reasons that abruptly stopping sugar can cause this symptom. If you used to regularly consume caffeine-containing sodas, energy drinks or specialty coffee drinks, and you cut these out along with the sugar, the actual cause of the headaches may be caffeine withdrawal. In the brain, caffeine helps constrict blood vessels, which makes this substance helpful in treating and even preventing headaches. The mechanism behind this involves caffeine's ability to block the uptake of adenosine, a chemical that causes blood vessels to dilate. If you habitually consume caffeine, then abruptly stop, the resultant increase in blood flow can lead to headaches. Eating too little food can also be the problem. Headaches are a noted side effect of low-carbohydrate diets, so consider this the culprit if your head hurts after drinking a protein shake for breakfast, or after eating just a small salad for lunch. Hypoglycemia, or low blood sugar, can also cause headaches, blurry vision, trembling, sweating and other symptoms. Hypoglycemia is usually associated with diabetes, but it can also be simply caused by a lack of food. Fasting for health or religious reasons can cause a headache as well. If your sugar restriction has prompted you to drink more diet beverages, this could explain your symptoms. Both aspartame or sucralose have been linked to headaches and migraines, according to a June 2009 review article published in "Clinical Journal of Pain." While a study published in the November 1987 "New England Journal of Medicine" concluded that aspartame, also known as NutraSweet, was no more likely to cause headaches than placebo, a study reviewed in the October 1994 issue of "Neurology" noted that some people are particularly sensitive to ingestion of aspartame and may suffer headaches. While the link between sucralose, known by the brand name Splenda, is not as well studied, there have been case reports indicating a connection, according to March 2006 report in "Headache." According to authors of a review published in the May 2007 issue of "Neuroscience and Biobehavioral Reviews," sugar can be addictive, particularly for people who consume it in a bingelike manner. Sugar leads to changes in the nervous system similar to those caused by cocaine and morphine, although with sugar, these effects are less intense. Research on sugar withdrawal symptoms has primarily been completed on rodents, where symptoms such as teeth chattering, tremors, head shakes and aggression occurred with sugar deprivation. However, there is insufficient human data to support that headaches are linked to cutting sugar out of the diet. --Slurred speech, vision problems, confusion, loss of memory or difficulty moving your limbs. --Nausea, vomiting, stiff neck or fever. --Pain behind one eye only, with redness in the eye. --Pain when chewing and weight loss. American Diabetes Association: Is Sugar Addictive? Human Brain Mapping: The Effect of Daily Caffeine Use on Cerebral Blood Flow: How Much Caffeine Can We Tolerate? Neurology: Aspartame Ingestion and Headaches: A Randomized Crossover Trial.